Cream 2 jailbreak tweak for iOS 10 is out and available to download now via Cydia. Here are the details on it. The arrival of the Yalu + Mach_Portal jailbreak for iOS 10, albeit in beta form currently, has led to a number of jailbreak tweak developers working to get iOS 10-compatible updates of their software ready for release. One such tweak that allows for the customization of buttons within Control Center is called Cream, and its developer has today made available an updated version, which supports iOS 10 and carries the perhaps obvious name of, wait for it, Cream 2. 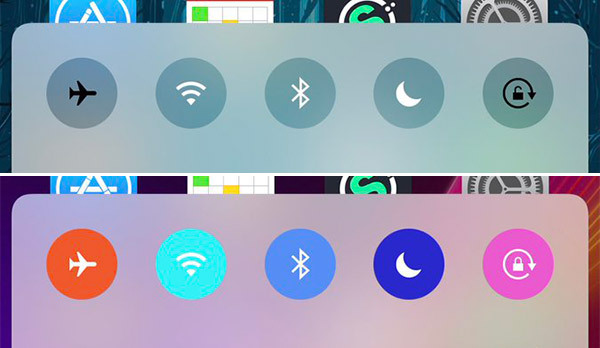 The update, which can be downloaded form Cydia now once the repo.cpdigitaldarkroom.com repository has been added, lets users customize what color each button uses when the Control Center shade is invoked. What makes it particularly great for those who enjoy a spot of iOS customization though, is the fact that they are not simply limited to a handful of predefined color options. Instead, a color picker is provided, allowing users to choose from a much larger array of color options when making their device look just the way they like it. Whilst all this customization may seem pointless to some, the original Cream actually made it easier to tell when a button had been pressed. Before iOS 10, Control Center toggles used translucent gray to signify the off position, while a simple white was used to show that a toggle had been switched on. By replacing that white with custom colors, Cream made it easier to look at Control Center and immediately know what is active, and what is not. In addition to revamping the Control Center, iOS 10 adds color to active toggles as well. You just can’t select any color you want, or the same color for all active toggles to get a simpler/minimalistic look. That is where Cream 2 comes in. Before you rush out and jailbreak though, it’s worth remembering just how early the iOS 10 jailbreak currently is in its development. If you are not sure what you’re doing, or do not have a spare device laying around with which to test things like this, then you perhaps shouldn’t be trying things out just yet. It may spoil everyone’s fun, but it’s better than a bricked iPhone.